(Eastern Pennsylvania) The table is set for romance with a new winery along the Berks County Wine Trail, just in time for Valentine’s Day Weekend: Ridgewood Winery of Birdsboro. Luscious menu of chocolates and wines will make for a tempting weekend visiting all 11 wineries along the wine trail during the trail’s annual “Chocolate & Wine Pairing Event Weekend” taking place Saturday February 11th and Sunday February 12th, Noon to 5 PM both days. Ridgewood Winery, the newest entree on the wine trail menu will be tempting sweethearts with a selection of Blackberry wine paired with locally made Blackberry chocolates from Lorah’s of Mohnton. Nearby Ridgewood, trail lovers will further sweeten the day with Manatawny Creek Winery’s decadent brownies drizzled with Raspberry wine ganache paired with Raspberry wine. Stoudt Country Winery, to the North, will be sharing bites of love with hand-dripped, chocolate covered strawberries paired with their Strawberry Wine. And throughout Berks County, other wineries along the trail will be sharing & pairing love! 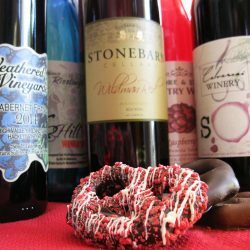 In the days ahead, the wine trail’s complete menu of many loving pairings of wines and chocolates will be posted to the “Events” page of the wine trail’s website. During Chocolate & Wine Pairing Event Weekend, no reservations or tickets are necessary, the featured wine & chocolate pairings are free. Lovers of wine & chocolate are encouraged to try wines from each winery’s full tasting menu during their visit. Several of the wineries do charge a modest tasting fee, often refundable with purchase of a bottle of wine. Great way to share the love after the event by cracking open a bottle of your new favorite wine discovered by you and your loved one. Bottles of wine are available for purchase at each tour stop. How to visit the wineries along the Berks County Wine Trail during this sweet weekend? Plan your self-guided tour of the wineries with information and maps available on the wine trail website. You and your sweetheart can enjoy a day trip of just a few wineries; or you can plan a romantic, get-away weekend of love, wine & chocolate! For those seeking a full weekend of wine & chocolate – the wine trail has partnered with two area hotels hosting some sweet, weekend packages: Microtel of Hamburg and The Crowne Plaza of Reading. Visit the wine trail’s website for details and hotel contact info. For more information about the 11 family-owned wineries along the wine trail, this event and other events, visit www.berkscountywinetrail.com. Lovers of wine are welcome to visit the trail wineries any time as well as follow them online.